Clean up crews at the scene of the Smyrna creek which turned white after a chemical spill. 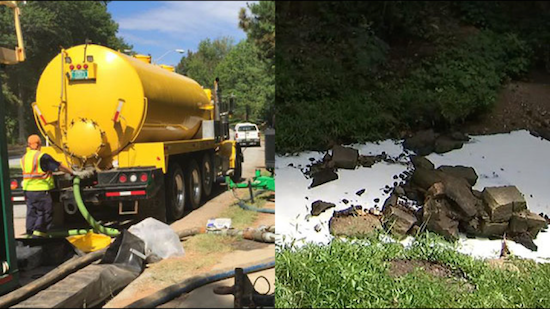 Workers were cleaning up a chemical spill from Apollo Technologies into a Smyrna, GA, creek Saturday that turned the water white. HazMat crews worked all day Monday to contain and clean up tens of thousands of gallons of carburetor cleaner from Apollo Technologies that leaked into the creek. By late Monday afternoon, the water was mostly clear, which was a big difference from the thick white water earlier in the day. “Whatever resources we need to make this better, we’re going to put those resources in place,” Apollo Technologies COO Geoff Ladue said Monday. Federal investigators were back in the neighborhood Monday keeping an eye on the cleanup. “Ensuring that the EPA, along with the state of Georgia, are the ones who determine how clean is clean, and we’re doing so from an environmental standpoint, from a community standpoint,” said EPA On-site Coordinator Jason Booth. PLZ Aeroscience has only owned Apollo for nine months. The company’s previous owner had a history of issues for which the company is still on the hook. “It’s not good. They have some serious issues there,” said Georgia Environmental Protection Division Compliance Director Bert Langly. Langly said the weekend spill that sent nearly a quarter million gallons of hazardous carburetor cleaner into the creek, once again put Apollo under a microscope. “They’re not really environmental professionals like you find with some of the larger facilities, so they have a tendency to let things get themselves in trouble,” Langly said. Since 2000, Georgia EPD has slapped the company with nearly $36,000 in fines for violations such as air quality to bad record keeping. Federal records show in 2012, the EPA hit Apollo with an $80,000 penalty for multiple violations inducing improper storage of hazardous waste. A 2014 report commissioned by the company, outlined environmental problems on Apollo’s property going back to 1992. The report recommended nearly $700,000 in remediation work. EPD said Apollo is making progress on those recommendations. “They’ve submitted three compliance reports with us, tracking what’s going on. They are on the schedules that they have provided to us to get the cleanup accomplished,” Langley said. Both the current owner and the EPA say neighbors are not in any immediate danger, but air and water tests will continue. The plant will resume operations Tuesday and the tank that leaked will no longer see use. The company has also hired engineers to inspect all of its equipment.